On May 15, the 4th game of 24th Asahi Open Championship between Asahi Habu and Fujii 9 dan was held. Fujii got Sente and Habu won the game. By this victory, Habu gained the 24th Asahi championship with the score of 3-1 following to last two years. Fujii took Shikenbisha(4th file Rook) in all the four games as expected. Habu did not use Ibisha Anaguma in this series. All his wins were made from quick attack against Shikenbisha. I think quick attack will be more popular in professional games this year. 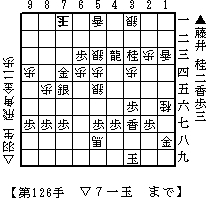 The left diagram is the resignation one when Habu made the 126th move of K-7a. After the diagram, Sente(black, lower side) could still give several check move to Gote(White, upper side)'s King, but in vain..
On the other hand, Sente's King is in brinkmate. If it was Gote's turn, there would be an easy mate such as R*4i K-3h +B-4h(mate). If he prevent Gote from R*4i by L*4i, it would be in vain again as following. Congratulation on Habu. He made a good start of the fiscal year 2006 with this victory.